Since 22 November 2018, the new toll sticker in lemon yellow is available in over 6,000 sales outlets at home and abroad. The validity period begins on 1 December 2017. The "old" vignette in cherry red remains valid until 31 January 2018. more lemon yellow. Attach the toll sticker in a visible location on the inside of the windscreen (our recommendation: at top left or near the rear view mirror). Attention: Do not attach the toll sticker in the tinted section of the windscreen. Attach the toll sticker on a clean and above all non-replaceable part of the motorcycle (e.g. a fork rod or the tank). Attention: A toll sticker attached to a luggage case or a motorcycle bag is not valid. The 10-day toll sticker allows a vehicle of up to 3.5 tons maximum permissible weight (mpw) to use the roads during a period of ten consecutive calendar days. The punch day (Lochungstag) is the first day. 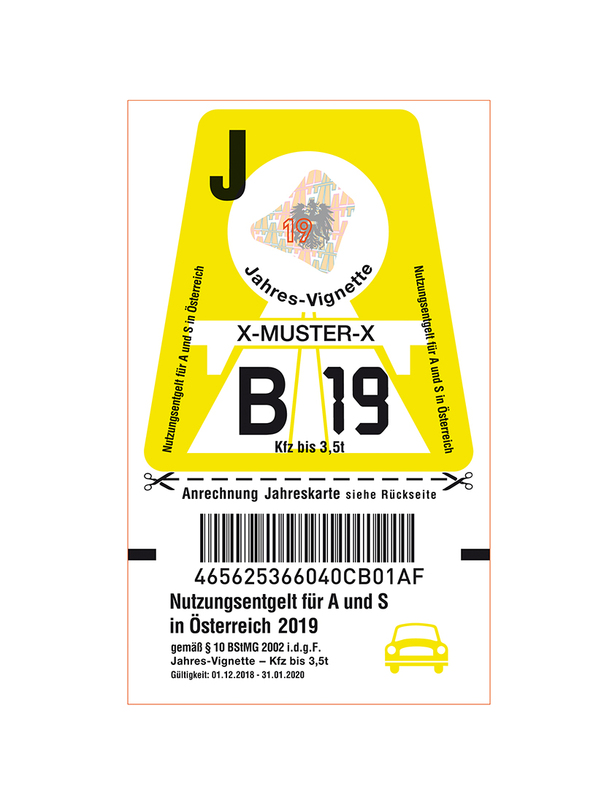 Example: The punch day (Lochungstag) is 10 January 2019 – which means the toll sticker is valid until and including 19 January 2019, midnight. The 2-month toll sticker allows a vehicle of up to 3.5t mpw to use the roads during a period of two months. It is valid from the punch day (Lochungstag) and expires two months later at the end of the day that is equivalent number-wise to the punch day. Example: Punch day (Lochungstag): 10 January 2019 – this means the toll sticker is valid from 10 January 2019 until and including 10 March 2019, midnight. The yearly toll sticker is valid for 14 months, from 1 December of the previous year until 31 January of the following year. PLEASE NOTE: If the toll sticker is not affixed to the vehicle it is not valid! Example: The yearly toll sticker for 2019 is valid from 1 December 2018 until and including 31 January 2020, midnight. All toll stickers are produced by a specialist company. Similar to a bank note, they have a security hologram that serves as the main protection against counterfeiting: when you tilt the toll sticker, the federal eagle and the motorway symbol shimmer. Also part of the hologram: The year "e.g. 19" refers to the toll sticker's period of validity from 1 December 2018 until 31 January 2020. Furthermore, the real toll sticker is not light-permeable even when you hold it against strong light. The same applies to the carrier foil: the writing on one side must not shine through to the other side. The surface of the toll sticker is made of a special material that reflects Using a torch, this effect can be easily observed when the toll sticker is attached to the vehicle. The empty field on the carrier foil – to which the toll sticker was attached before being pulled off – must not have any adhesive residue on it. In addition, you can also make a toll sticker authentification online. By entering the toll sticker number including the check digit, the system detects whether the toll sticker is a correctly printed one. The toll sticker number can be found under the printed barcode.